right now, i am simply going with the flow.. and basically that means every weekday i rudely awake from my quite entertaining dreams, have a shower, grab a coffee, jump on at least one bus and eventually end up at my designated work area… but amongst all this routine i also experience a few pleasant surprises… and it’s these small phenomena that remind me of how awesome it is to be me and what life is all about! but at work, you see… i have no idea what the next step is… and as time goes on i find myself getting trapped doing mundane tasks that any well-trained monkey could do while smoking a fine imported cigar. 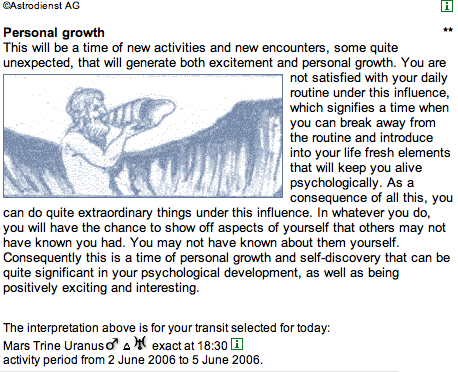 2006-06-03 14:35 UPDATE: ohh neat.. i guess the planets (rather their transits) do control my life… check out my horoscope!